The year my father died, I became a mother for the first time. My father came to see me in the hospital, a day after I had given birth. He came with my mother. 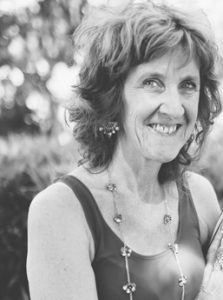 She had pressured me to give birth sooner than I could simply because she wanted to go away to Canberra to meet with her eldest son. She and my father had been estranged from this son for years and now it looked as though he would welcome my parents back into his life. The fact that I was about to give birth mattered less to my mother than this opportunity to reconnect with her first-born. It also mattered less to her that my father, whose lungs had collapsed with emphysema, might not manage the journey. They were going and that was that. I stopped answering my mother’s calls. It annoyed me that she feigned interest in how I was going when in fact all she wanted was to see me birthed. The doctors had given me a due date a week earlier and as each day passed I grew more and more frantic. When my baby was born at last, and my mother gushed into the ward to see the twelfth of her eventual twenty-three grandchildren, I found the greatest pleasure rested, not in her response to my little girl, but in my father’s. He sat on a chair near the bed and looked on as my mother bubbled over. He did not ask to hold my baby but gave a big smile when I peeled back the blanket from her face. After only ten minutes, he excused himself. It would take him at least ten minutes to get back to the car park. My mother could stay and talk to me while he made his way out. I watched him as he struggled along the corridor. Twice, he stopped and sat in a chair propped on one side. Twice, he looked as though he might fall over with the effort. Twice, I watched him draw breath back inside his lungs before he had the strength to move on. And then he was gone from view. We buried him in the Cheltenham cemetery, behind a fence that led onto a golf course. At one point during the burial, my daughter started to cry and my husband took her away from the people scattered around my father’s open grave. He decided to lay her out on a flat gravestone so that he could change her nappy. Someone called out over the fence when they heard the sound of a baby. A golfer who was alarmed perhaps that things were not right and my husband reassured him. And so these two events are cemented together in my memory, birth and death together. The old making way for the new. What a rich, uncommon memory with such a complicated back story. Beautiful picture. Thanks for your kind words, Kass. This memory came about through the juxtaposing of two events, the birth of my first daughter and my father’s death. Funny what can come up when you settle for thoughts about the past. My parents waited twenty-one years for me and twenty-one years for their first grandchild. The day my daughter was born I returned to the hospital after a nap—she was born in the early hours of the morning—and was surprised when my parents appeared. I’d phoned them and told them they were grandparents but found myself genuinely puzzled when they turned up with the most beautiful (and expensive) dress. I don’t know why I should’ve been puzzled but I was. I honestly never expected them. Oh, I knew we’d see them eventually once we were back home but I didn’t think they’d make the trip to the hospital. They never saw their granddaughter in the dress although I do have a photograph. My wife machine washed it and ruined it; they never forgave her for that, at least my mother never did. My mother nearly died having me. She nearly died having all three of us, something she was not slow in throwing in our faces when we disrespected her growing up. Once she’d recovered and was fit to travel my parents drove down to the north of England to present their firstborn to her mother (I’m assuming her father was dead at this point) and were bitterly disappointed when the woman showed next to no interest in me preferring to fuss over the little black baby the woman next door had just had. Dad vowed never to go back and my dad took his vows seriously; he never did. There’s so much sadness in your story here, Jim, the ways in which you expected so little interest in your parents and they in turn in theirs. And the idea that your mother should somehow blame her children for the nature of their births, that’s cruel. It happens, I know and I can only imagine that your mother was deeply unhappy, resentful, herself deprived to throw that in your faces. How can a baby be held responsible for his own birth? Too many babies get loaded down with responsibility for things they can do nothing about, and are helpless to prevent and to deal with. Interesting. I don’t know that you meant it this way, but the father comes off as the “good guy” and the mother as somewhat bad. At least that’s how I would have taken this had I never read your blog before. Of course, I have read your blog before, so I don’t, or can’t, take it that way at all. Since you chose not to bring up the difficulties you had with your father (as related in previous posts) I won’t either, and I apologize if I’ve said too much already, but there is a bit of irony involved here. I can understand your misgivings, Kirk. At this time in my life my father had changed somewhat, as in he no longer drank alcohol and he had settled into a quiet mournful phase where he had begun to take some responsibility for what he once did. I wrote this piece in recognition of a desire that I believe most children share, a desire for some recognition from their parents, mothers and fathers. For all her foibles, I felt my mother recognised me, at least to some extent, but I never got this from my father. To my father I felt invisible, except at this moment when he smiled at my baby. Smiling at my baby, he might as well be smiling at me. Thanks, Kirk. I’ll never forget the images of this post — the beautiful way you wove the words. I just love your writing, Elisabeth — have read it for years and am struck by how rich it is. That’s lovely to hear, Elizabeth. The feeling is mutual. And we share the same name despite a different middle letter, the ‘s’ and the ‘z’. Thanks. Birth and death. So intimately linked. 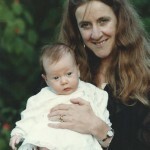 We attended my beautiful mother-in-law’s funeral when our second son was 9 days old. We think she knows he had arrived, but she was lapsing into unconsciousness on the day he was born. As my husband signed his hospital admission papers 24 years later to have surgery to try and remove the cancer that claimed his life, he realised the date was the same as his mothers funeral. Damn dates. Damn cancer. It’s taken all his family. It’s uncanny the way certain dates come together as you describe here, Karen, your husband’s diagnosis with his mother’s funeral and her death when your own little one was 9 days old. It certainly reminds us of the cycle of life and our interconnectedness. Thanks, Karen. It’s good to hear from you again. I love the juxtaposition of birth and death in this piece, and although I know I shouldn’t, I’m laughing at your mother wanting you to hurry up and give birth so she can visit your brother—how could you have timed the birth so inconveniently for her?! The changing your daughter’s nappy on the gravestone reminded me, too, of how my sister died on my cousin’s first birthday. My aunt brought my one-year-old cousin to her funeral, which we videoed, and throughout, you can hear a baby gurgling. It’s quite lovely—a reminder that life will go on. 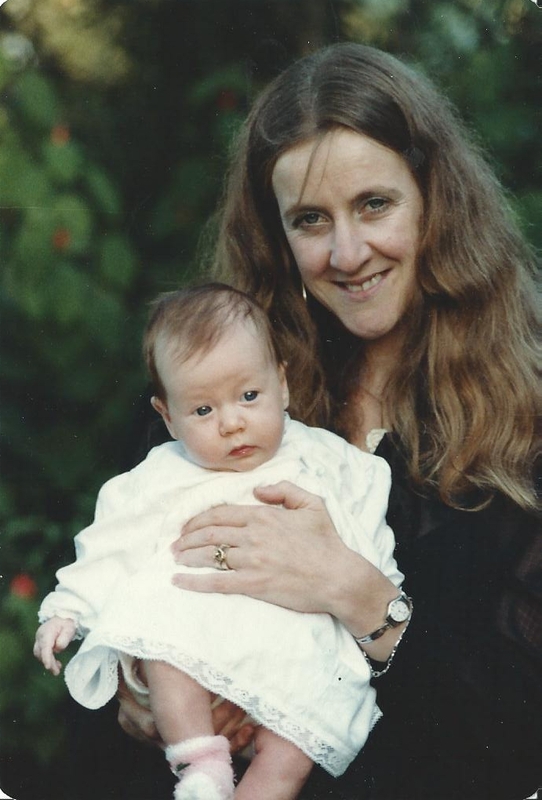 Life and death, Louise, they come together when we least expect them, when once I’d imagine people saw them as much more closely linked, given the number of babies and mothers who died in childbirth. The more we get past these awful statistics with the advent of good medicine, the more easily we forget. Thanks again, Louise.